It's a beautiful morning here in Sibu. I think one of the things that we will miss most when we come home is the hujan. That's the rain. Once in awhile I check the weather back home and see the forecast for dry and windy conditions. There isn't much of either here. The rain is refreshing as it makes the humidity more tolerable and it lowers the temperature by a couple of degrees. 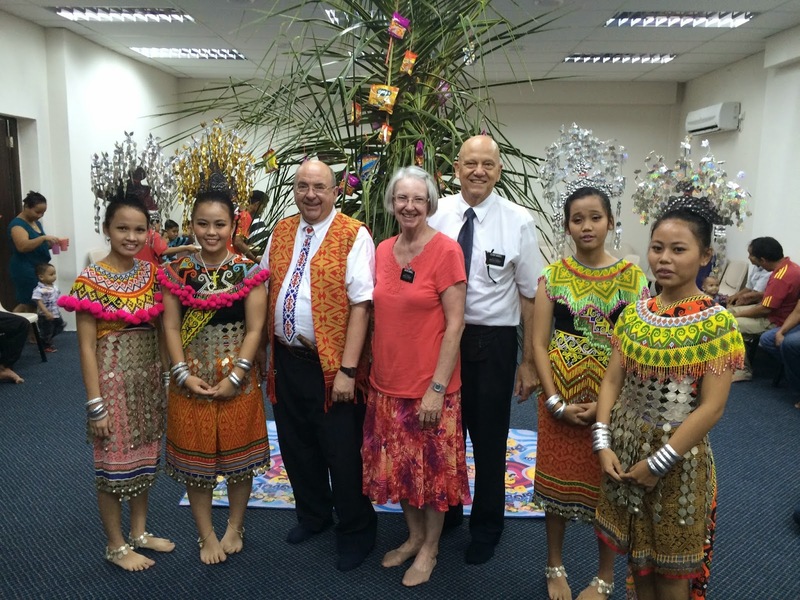 Sister Bodell had a surprise call from Elder Misa Monday night. Whether he meant to call her or not is irrelevant. It could have been a pocket dial. Anyway, when Sister Bodell answered the phone, he wished her a happy Mother's Day. We miss him. He was one of our ZLs when we first arrived. We had a great District meeting on Tuesday. I don't know where these young come up with their ideas, but the training we receive is outstanding. The training for this meeting was all about attitude. No one force us to be happy or sad. It's our choice. Our attitude determines our altitude, or wether our thoughts and moods are elevated or keeping us down in the dumps. Elder P did an awesome job. Sister Bodell always provides some sort of treat for District meeting. This week she made 7-Layer dip and cream puffs. The Elders went crazy with the avocado, wondering where to get some. Avocados are plentiful at the present time. Sister Bodell also made her own salsa. We found a jar of dried "coriander leaves". That's the same thing as dried cilantro. They worked very well. And yes, the cream puffs went over very well, too! There is always a discussion of where to go to lunch after District meeting. I suggested we go to the Noodle house because none of our present district had been there. We loaded up the van (still a little small for the entire district of eight Elders) and drove over to the cafe. It was closed. However, on the way we passed another restaurant that looked promising. It was definitely promising! It had table cloths, nice silverware, goblets for ice water, real napkins, delicious food! It's not a place that the Elders would go everyday as it's kind of pricey, but well-worth it. They were pleasantly surprised, however, when they each went to pay their bill. Sister Bodell had already paid for everyone. The name of the restaurant is Australian Story. Our waiter, whose name I didn't catch and Elder V.
The waiter kept referring to us as Elder and Sister. I asked him how he knew. 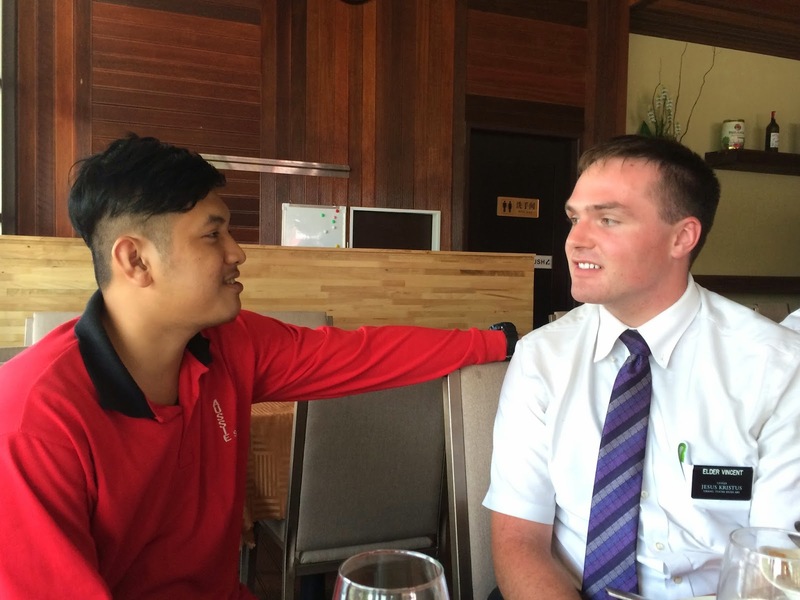 He told us that he is a member, baptized in the Philippines, had been a member for seven years now, but was less-active because of working. This is a major reason for so much inactivity in the Church here. It's either work or transport. It's a sad situation. 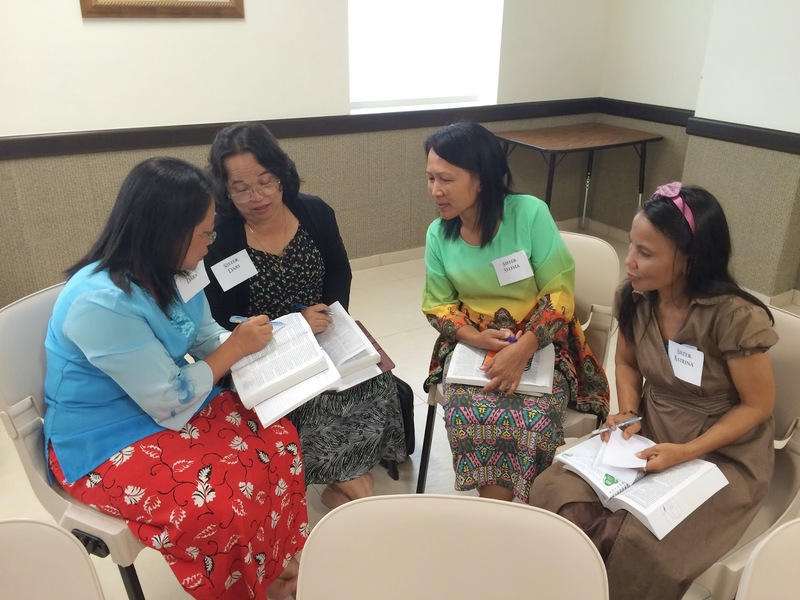 The rest of the week was used for planning our Seminary & Institute Inservice for Saturday. 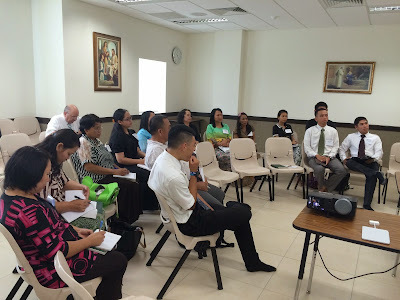 What started out as a group of three grew to an event with 11 S&I Teachers from Sibu, Sibu Jaya, Bintulu, and Kuching. Those from Bintulu came via a three-hour bus ride. Those from Kuching came by a 40 minute a plane ride. The inservice went very smoothly. It was six-hour affair including an hour for lunch. 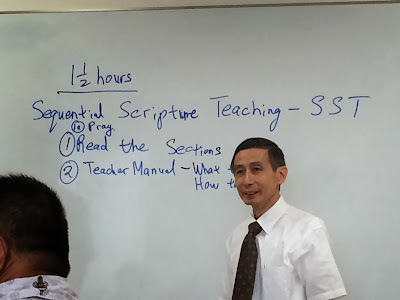 The teachers were well-taught. 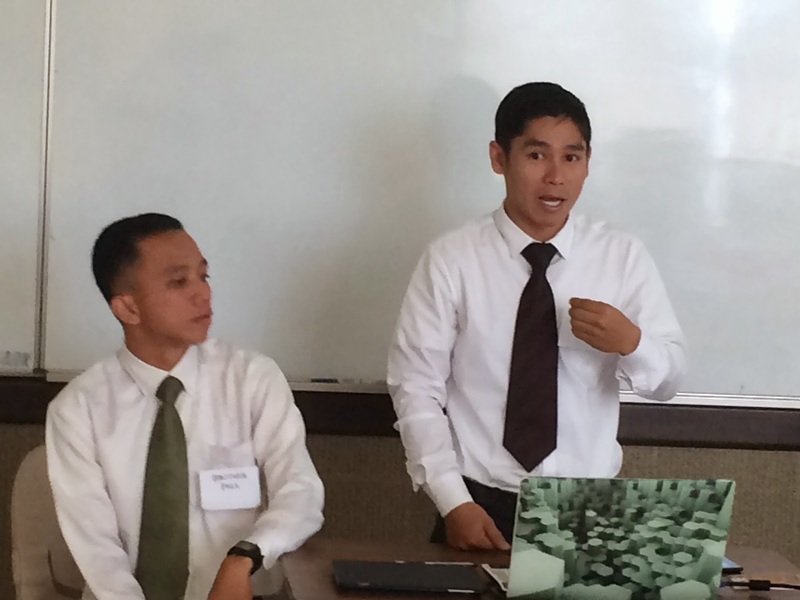 It was great to have Brother Paul and Brother Kelven from Kuching to present. They are super S&I teachers with great attendance rates for their classes. They talked about preparing and presenting lessons in Malay. No translation necessary for the teachers . . . only for those white people who don't speak Malay. 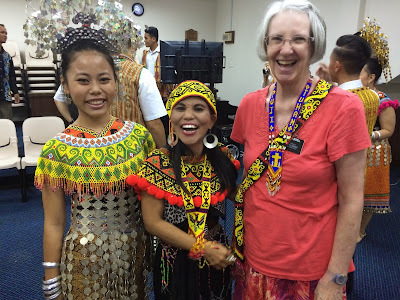 Happy Gawai! Later that night we attended two branch Gawai celebrations. The first was in Sibu Jaya; the second with Sibu Branch 1. 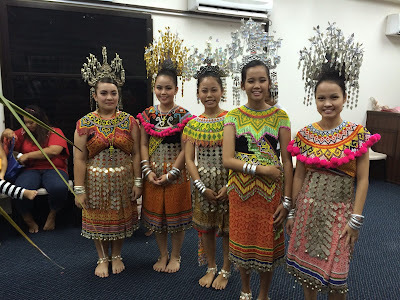 Gawai is a celebration of the local Sarawak Dayak (Tribes). The tradition started very small back in 1963, and has grown to national holiday status. The actual holiday is June 1-2. It celebrates the end of the harvest and the beginning of the new planting season. Each dayak celebrates with traditional music and food. Everyone tries to go home to their family kumpong to celebrated with much merriment and drinking. 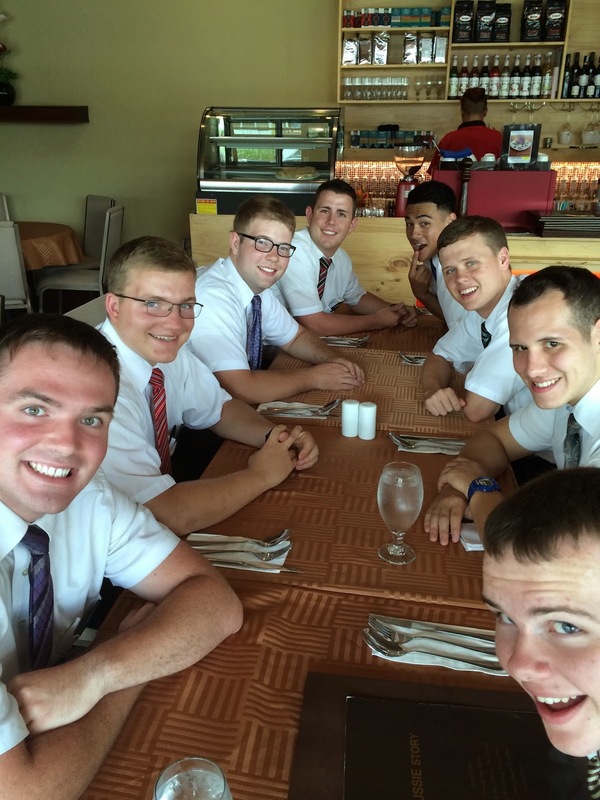 This is hard for the members of the church because they don't drink like their families do. Some stay home; some stray and drink. It's a tough time. Tradition is strong with these people. I'm told that on the weekend of Gawai there are very few members left in Sibu for church. The first and second branches are planning on combining their meetings that Sunday. I will have to report on that later. Sister Katrina and Sister Bodell. Sister Kat made the beaded necklaces, over the shoulder straps. Very talented! The beaded tie I'm wearing was made by Sister Katrina. Next a couple of videos from the Sibu Jaya party. This is the Welcome Dance. This was performed at the beginning of the party. I don't know what this next dance is officially called, but for want of another name, I'll call it the sword dance. It tends to go forever, at least until all the "fruit" of the tree is cut and placed in the basket. After the fruit is all cut, the tree is chopped down and removed. You'll get the idea watching the first four dancers. You may recognize two of the dancers. The music is pretty repetitive in all their dances. It was all quite similar at the Branch One party, but the youth weren't dressed in costume. I did have to do the sword dance again . . . with a pair of scissors! Not quite as exciting, but still was fun. 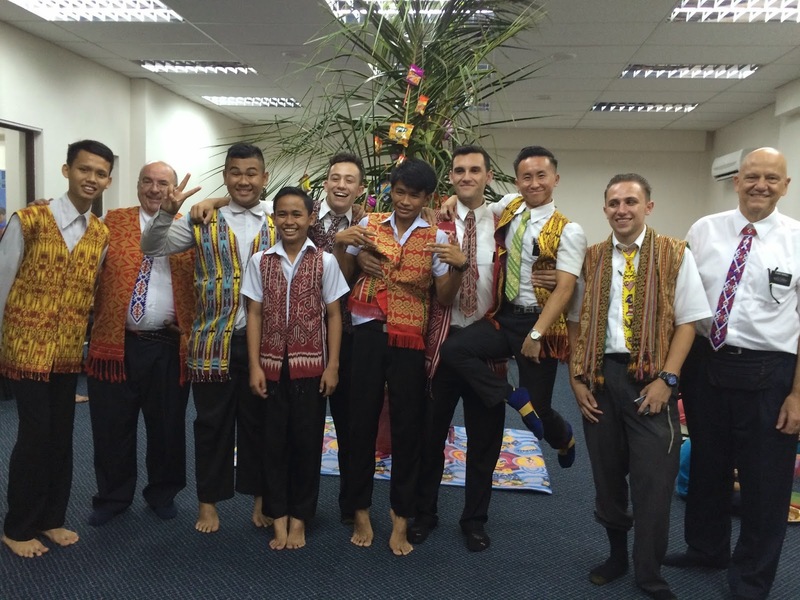 Next Saturday we will attend Branch Two's celebration of Gawai. There will be more pictures and video I'm sure. Until then, have a pleasant week. We're off to Singapore on Monday for Zone/Senior Conference and our three-month visa renewal. There will be lots to share next time.